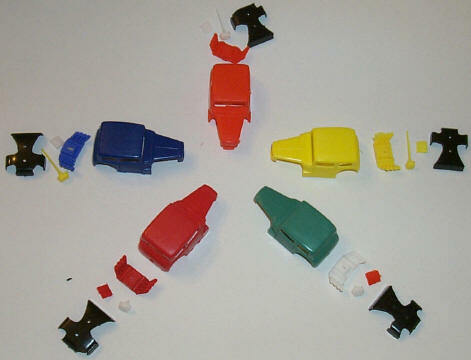 We are offering a limited supply of quality resin bodies that are being made by a former employee of Tyco. These are really made well! Currently we have the body styles shown below, with more to come in the future depending on demand. Please note that only 1 of each item listed are currently available, so first come, first served on these. Prices for the unfinished, unpainted bodies is $18.00 each, and will require some minor trimming of plastic flash around windows. The finished Superbird is $30.00. The finished Green Hornet's Black Beauty is $32.00, and will require custom fit skinny rear wheels and tires on your Tyco chassis to clear the rear fender skirts. These bodies snap onto the chassis you supply. Includes engine pipes, front radiator, parachute, and windows. Molded in the colors shown. No mixing of part colors please. Clockwise starting at 12 o'clock are orange, yellow, green, red, and dark blue bodies currently available. $18.00 each. Resin Green Hornet's Black Beauty body, finished, for Tyco chassis. Molded in black, then very nicely painted in gloss black and silver details added. Not available. Resin red Cheetah body, unfinished, for the Tomy Super G-plus chassis. Molded in red or lime green. Includes windows. Not available..